GÖTTINGEN, Germany — In an environment of growing international security threats, the German government is reversing the trend of recent years and is proposing a significant hike in defense spending for the next fiscal year. Federal budget proposals for 2017, released March 23, have earmarked an additional €1.7 billion (US $1.9 billion) on defense — a 6.8 percent rise on planned spending for the current year. Under the proposals, the German armed forces will receive €36.61 billion in 2017, compared with the current year's €34.29 billion, and more than double the growth rate of 2.7 percent for the federal budget as a whole. Yesterday the cabinet approved the budget proposals for 2017 and the financial planning until 2020. The approval marks the starting point of the budget process that will end with the parliament`s authorization late in the year. After moderate increases in 2018 and 2019, the government is earmarking €39.18 billion for defense in 2020. Compared to earlier plans, the increases will see an additional €10.2 billion pumped into the armed forces in the next four years. Part of the money will be used to modernize equipment, the Defense Ministry said in a statement. Despite the proposed budget hike, Germany will still only allocate 1.2 percent of its GDP for defense, Federal Finance Minister Wolfgang Schäuble said at a news conference in Berlin. Nevertheless, the hike reverses German government policy of dedicating less every year to the armed forces as a percentage of GDP. The finance minister said there was a need to focus the federal budget more on external and internal security. 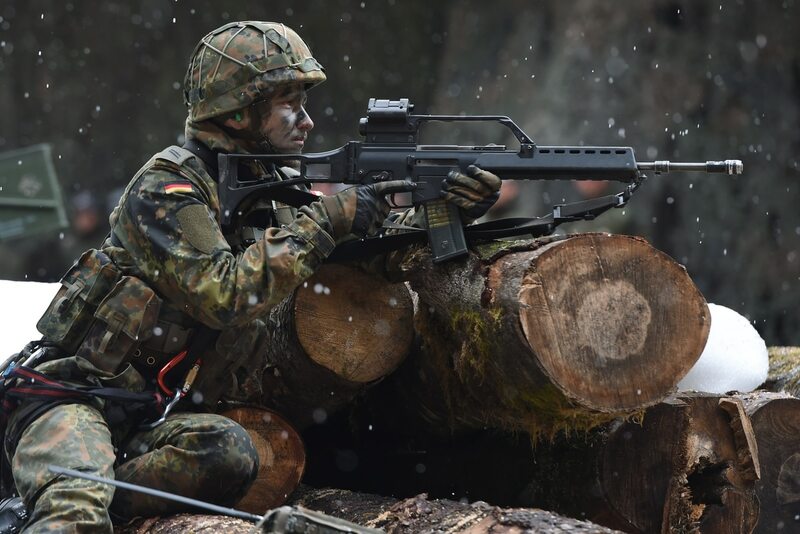 Despite the significant budget increase, there is doubt whether sufficient funds will be available to see through the projects that Defence Minister Ursula von der Leyen requires. In January, the minister announced a plan to invest €130 billion on procurement by 2030. According to an estimate by Tobias Lindner, defense and budget expert of the Green Party in the Bundestag, this means €50 billion more will have to be found for the defense program than previously planned for in the 14 years up to 2030. From this he calculates a minimum extra expense of €3.6 billion annually and draws the conclusion that the wish list of the secretary of defense is far greater than the means that Wolfgang Schäuble will give her to fund it. Another fact is that part of the extra money will flow into research, development and personnel costs, wages particularly, as there is a likely imminent extension of troop numbers beyond the current level of roughly 179,000. Several newspapers recently reported that the Ministry of Defence would create an additional 7,000 military and 3,000 civilian positions. There is little likelihood though that Germany will ever reach the NATO expenditure target of allocating 2 percent of GDP to defense. That would entail a defense budget of roughly €60 billion — numbers that would dwarf Europe's leading military powers, Britain and France. The British last year dedicated 2.07 percent (£39.02 billion) and France 1.8 percent (€39.2 billion), according to NATO figures. Both of Europe's biggest military powers are increasing defense spending. Policymakers are aware of the likely political fallout of any increase in German spending, which makes Berlin the biggest military power in Europe, as well as the biggest economic power . The German move reflects the general trend in NATO of rising spending after a long period of shrinking expenditures as many in the alliance increase budgets in the face of a worsening security situation, particularly on Europe's eastern borders where Russian aggression has set alarm bells ringing. Sixteen alliance members increased their defense spending in real terms in 2015. Twelve of these countries were forecast to have increased their defense spending as a percentage of GDP, NATO said in a January report. Countries like Poland, Norway and the Baltic nations are all responding to the increasing concerns over security by enhancing defense expenditure. A report published last month, funded by the European Defence Agency, said fear of Russian aggression will help drive an 8.3 percent rise this year, halting a 20-year decline. The rise will be most pronounced in central and Eastern Europe. Poland, the main player on NATO's eastern flank, is increasing spending this year by 9.5 percent to 35.9 billion zloty (US $9.38 billion) compared with last year. There's every prospect the new conservative Law and Justice party, elected last November, will continue to push spending up: It has been campaigning to hike the defense budget beyond the 2 percent of GDP this year to at least 2.5 percent. Not all European governments are responding to the changing strategic situation by raising budget spending. For example, Italy is implementing cuts, particularly in procurement. A 2016 budget document released at the end of 2015 indicated the Italian MoD would spend €12.92 billion this year, down 2 percent on the €13.19 billion spent last year. Procurement is due to drop 17.7 percent to €1.95 billion, although the Defence Ministry will also receive its usual, hefty backup payment from the Italian industry ministry to help reduce any shortfall in orders. Details of that cash will be made available in a secondary budget document to be released this spring, which will also give a breakdown on spending per program. Tom Kington in Rome, Andrew Chuter in London and Jaroslaw Adamowski in Warsaw contributed to this report.